一直陪伴著我繪畫創作的Fm99.7, 常以精緻的經典樂章和優雅的導聆,充實溫暖我的心,也澆灌了我常用的題材”玫瑰花.”看著她隨著音樂,隨著感動在有界實無界的畫面上盡情綻放.幻化,散發出些許期待的藝術氣息與芬芳.,有時候晚上, 我閉上眼睛, 回想一下, 我聽那一首曲子時畫那一副畫, 每每一幕幕畫面閃過腦際, 伴著我的是一個個會心的微笑…….使我忘卻了疲憊, 忘卻了老之將至…..走進甜蜜夢鄉. 繪畫創作的意義,可歸類在藝術創作的行列,它和其他類別的藝術創作一樣不但豐富了人生,提昇了社會人文,也照耀了人類的文明. 音樂家海頓是一位非常敬愛造物主上帝耶和華的藝術創作者,他以敬虔的態度與堅定的信仰,創作音樂,使之充滿虔誠溫和堅忍的震撼力,聆聽他的音樂,謙卑喜樂與希望之情油然而生.音樂家韓德爾 的彌賽亞更是一部安慰人類振奮人心的曠世鉅著.法國畫家米勒,結合讚美勞動價值的思想與對他影響至深的正規教育, 創作了”拾穗”, “祈禱”, "播種者” ….等感人至深的世界名畫,由此可見思想,與信仰,在繪畫創作中極具份量.是鑑賞作品的要點.這種能量的蘊釀 也是我努力的方向, 從規律簡樸的生活開始, 注意身心健康,保持活動力,珍惜時光,研讀聖經,虛心探討真理,見賢思齊, 身體力行,並深思反省,痛改昨日之非,昨日之惰,昨日之愚…..也唯有這般覺悟,方能期待有足夠的精氣神從事”繪畫創作”. 總而言之,繪畫創作像一棵樹,一株花,心田既已欣然播下喜愛繪畫的種子, 就要不斷以熱忱與努力澆灌,.有一天它會開花結果,雖然 每個人開的花,結的果不一樣,但終必各自擁有 一片天.”唯有努力,唯有行動,唯有實踐,”乃當下論及創作理念之結語. 記得當年畫家李石樵老師回答”如何指導美術資優班學生?”這個請教的問題時, 老師也是這般的說法,” 需要鼓勵, 更需要不斷努力”, 願以此與熱愛藝術創作,支持藝術創作的朋友共勉. About the Artist Hsiu-Hsia Rose Chiu is a Taiwanese watercolor artist. 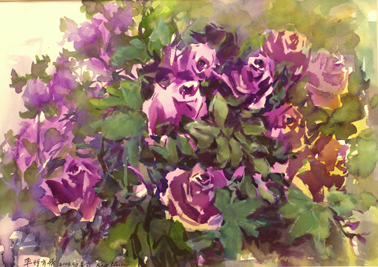 She expresses her sentiment and talent by using different techniques of Chinese and western watercolor painting. Rose is known for painting beautiful roses with an effortless grace. Throughout 30 years of teaching all ages, she introduce painting skills, encourage artistic vision, and shares her inspiration and appreciations from the blessings that are given to all from Nature-from God. Rose is motivated by the great time she had when creating unconstrained artistic effects and giving full expression of delicacy of watercolor. No wonder Rose always says” Creating arts is ultimately delightful…...” Rose Chiu Holds a master degree from Art Department of National Taiwan Normal University. She has won many rewards from arts competitions and she has received recognitions of contributions to art education. Rose had three painting albums and two audio painting albums published. 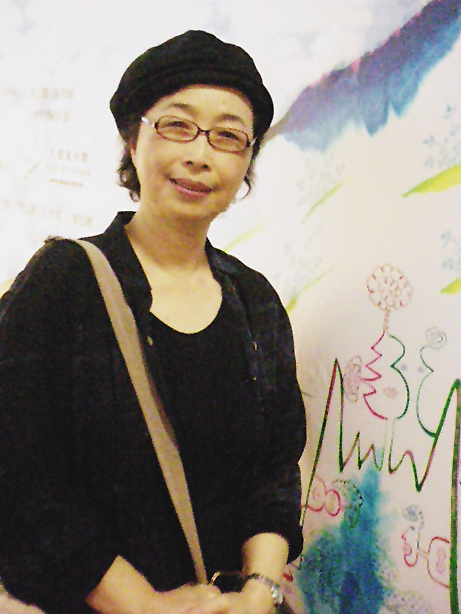 They are all part of the achievements of her solo arts exhibitions in Taiwan and in the USA. Enjoying her artist’s lifestyle, Rose currently travels, sings and continues to express her visions through painting.